New Zealand Geodetic Datum 2000 (NZGD2000) is a ‘semi-dynamic’ datum in that coordinates are published in terms of their values at the reference epoch of 1 January 2000 and it incorporates an as yet unpublished deformation model which allows positions at other times to be extrapolated. The proposed deformation model has two components, 1) a national deformation component using a latitude/longitude grid which is spatially and temporally continuous, and 2) a number of ‘patches’ used to model specific deformation events such as earthquakes. The national model will comprise a series deformation grids at fixed time intervals between which the deformation can be interpolated. The patches are localised triangulation based models of limited extent and time that can represent arbitrarily complex deformation. 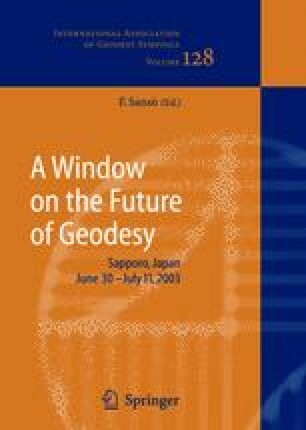 This is seen as meeting both the needs of the geodetic community, who require accurate coordinates at arbitrary times, and the mapping community, who prefer static coordinates, but expect them to reflect major deformation events.